Fernando Botero, born in Medellin, is one of the most celebrated contemporary Latin American artists. His major works include figurative paintings along with his popular monumental bronze sculptures. Botero’s success has made him one of Colombia’s most beloved sons and benefactors. Last year, the artist donated nearly 200 paintings and sculptures, valued at over $100 million, to museums in Bogota and Medellin. Along with Botero’s own works, the donation included paintings and sculptures by Pablo Picasso, Claude Monet, Salvador Dali, Joan Miro, Wifredo Lam, and Edgar Degas. 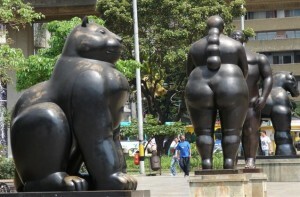 Visit Plaza de Botero and The Museum de Antioquia to see more of Fernando Botero’s work on display.